This kitchen cabinet pull has a fun twist design that adds character to any room. Whether used as kitchen cabinet drawer pulls, cabinet door handles, bathroom vanity hardware, or dresser drawer pulls, this fun twist design will add a unique style throughout your home. Total pull length top to bottom is 3 1/2″ long. Pendent part of the pull is 3″ long. Domed back plate is 1″ in diameter. Our line of iron cabinet hardware features a soft to the touch smooth natural black wax finish to keep it looking beautiful for years. 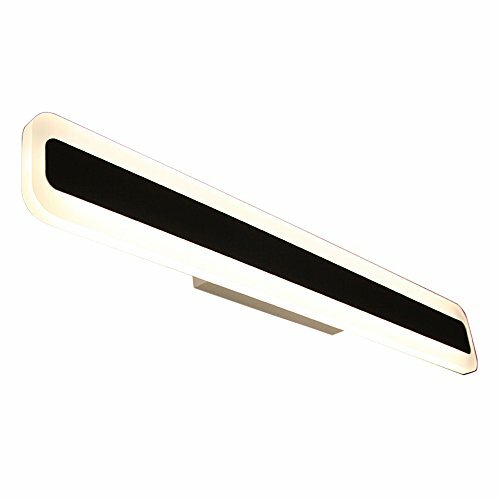 Unless otherwise stated in the listing all of our finishes are intended for indoor use, including all cabinet and door hardware. Exposure to moisture, humid conditions, and salt water environments may cause rust. 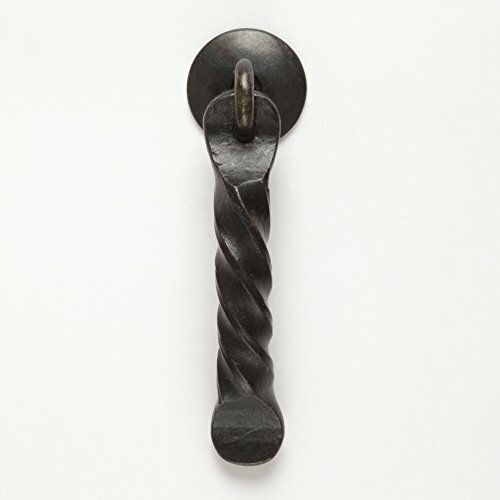 This blacksmith forged cabinet door pull has a fun twist design that looks great in any kitchen. Use these as dresser drawer pulls, kitchen cabinet pulls, and bathroom vanity handles to add a unique style to every room. 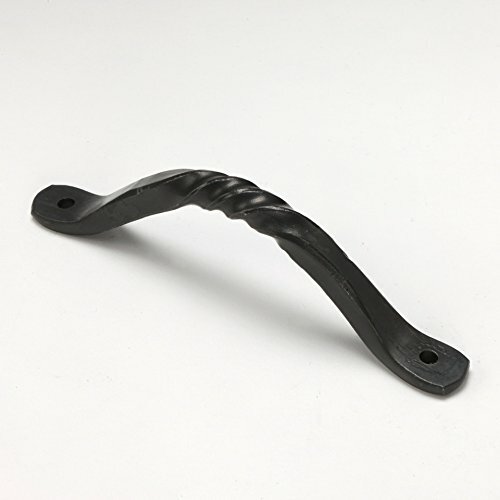 This fun twist design is a favorite in our line of wrought iron cabinet hardware. Whether you are redecorating, giving an old piece of furniture a new look, or building something brand new, our decorative cabinet handles and pulls make any room or project more fun. Our wrought Iron hardware line features a soft to the touch smooth natural black wax finish to keep it looking beautiful for years. 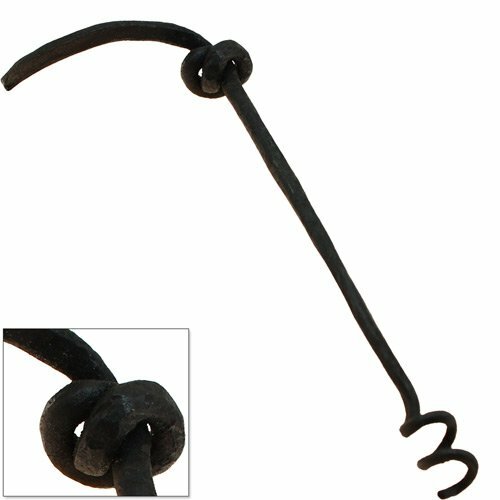 5″ center to center hole spacing 5 3/4″ total length 1 5/8″ total height Twist is 7/16″ thick Handle lengths may vary slightly due to the item being handmade. These handles come with #8 x 3/4″ slotted and textured black screws. We also supply extra screws with all orders free of charge. Unless otherwise stated in the listing all of our finishes are intended for indoor use, including all cabinet and door hardware. Exposure to moisture, humid conditions, and salt water environments may cause rust. 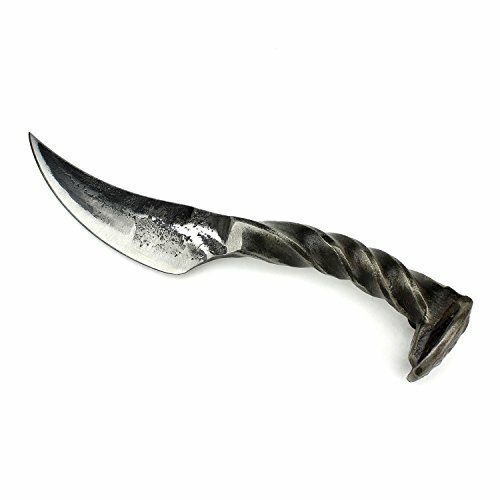 The K11 is a hand forged railroad spike knife with a strength and weight that will last for years. If you're looking for groomsmen gift ideas or trying to think of a birthday gift for him, or a 6th anniversary gift, here is your answer. Created by blacksmiths with years of dedication to quality craftsmanship and heritage tradition, this wrought iron knife has a twisted handle that can be personally engraved on the head for any special occasion. Add a name, initials, a date, or special message. For use or display, consider a leather knife sheath or railroad spike display stand to complete a knife gift for him or her. Knives are 8.5" total length, 4.5" blade, 4" handle. Wire brushed finish with a natural wax coating to protect the blade. Dimensions may vary slightly as each item is handmade and forged independently. We file sharpen and harden them to hold an edge. For a finer edge the customer must apply a wet stone or graphite stick. We recommend these knives for light to medium duty use. They are intended for average functionality as well as show. We do not recommend them for heavy duty use or survival type use.